As old as a roadway that was once a Native trail, as new as the suburban subdivisions spreading across the American countryside, the cultural landscape is endlessly changing. The study of cultural landscapes—a far more recent development—has also undergone great changes, ever broadening, deepening, and refining our understanding of the intricate webs of social and ecological spaces that help to define human groups and their activities. 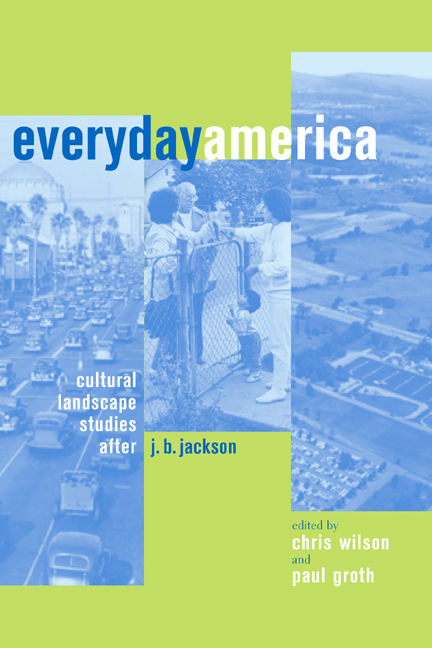 Everyday America surveys the widening conceptions and applications of cultural landscape writing in the United States and, in doing so, offers a clear and compelling view of the state of cultural landscape studies today. These essays—by distinguished journalists, historians, cultural geographers, architects, landscape architects, and planners—constitute a critical evaluation of the field’s theoretical assumptions, and of the work of John Brinckerhoff Jackson, the pivotal figure in the emergence of cultural landscape studies. At the same time, they present exemplary studies of twentieth-century landscapes, from the turn-of-the-century American downtown to the corporate campus and the mini-mall. Assessing the field’s accomplishments and shortcomings, offering insights into teaching the subject, and charting new directions for its future development, Everyday America is an eloquent statement of the meaning, value, and potential of the close study of human environments as they embody, reflect, and reveal American culture. Chris Wilson is J. B. Jackson Professor of Cultural Landscape Studies at the University of New Mexico. He is the author of The Myth of Santa Fe: Creating a Modern Regional Tradition (1997) and Facing Southwest: The Life and Houses of John Gaw Meem (2001). Paul Groth is Associate Professor in the Departments of Architecture and Geography at the University of California, Berkeley. He is author of Living Downtown: The History of Residential Hotels in the United States (1994) and the coeditor of Understanding Ordinary Landscapes (1997).